Kitchen design can at times turn out to be somewhat tricky. Due to the nature of the space this cannot be refurbished easily. It remains constantly in use. So giving it a new look seems to be notoriously difficult. But you can easily change small things and give this space a completely new look. These tips will show you how to achieve it in style. Working in a light filled interior is so easy and enjoyable. A dingy and dark room immediately discourages anyone. If you have sufficient natural light in this space, then use it to the maximum effect. Don’t place furniture or décor items in front of the windows and block the light. 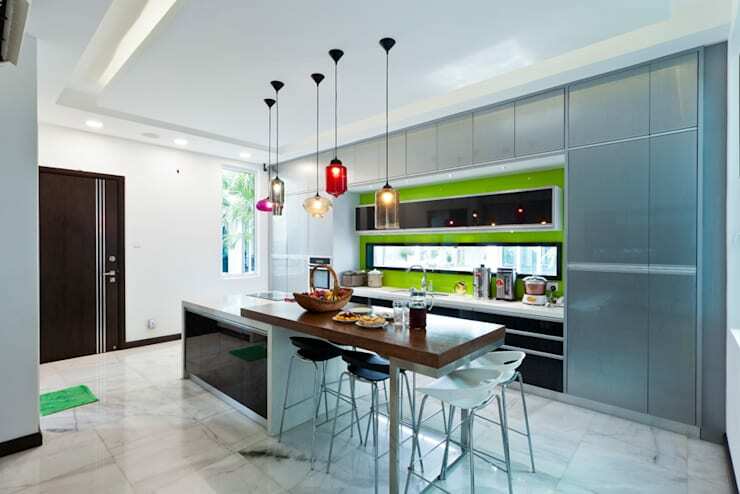 Upgrade the lighting fixtures of your kitchen. 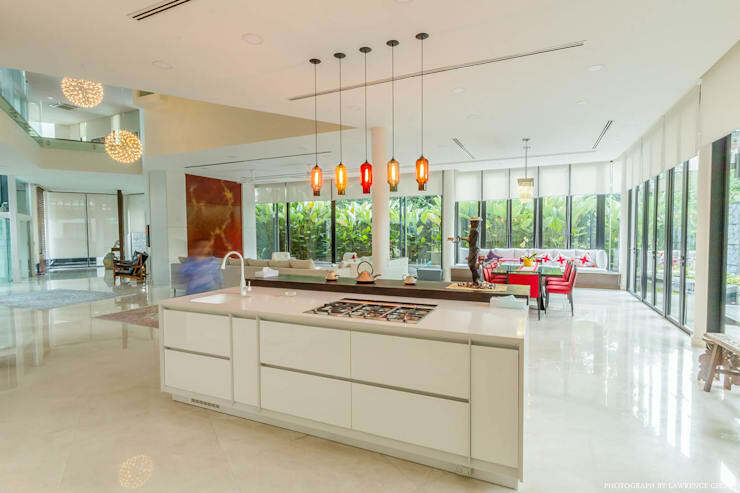 Invest in stylish chandeliers appropriate for modern homes or chic pendant lighting. You may also install wall sconces in the corners. Invest in LED lighting fixtures. They will help you save on your energy bills. For some extra glitter, consider have under cabinet lighting fixtures. They will increase the warmth of the ambience. Decorate a feature wall that immediately draws attention. You can use different materials like stone veneer, exposed bricks, wood panels, ceramic tiles and stucco. Decorating the feature wall with washable wallpaper could be another way of giving this space a refreshing look. Choose geometric motifs for a contemporary kitchen. Don’t wallpaper with a busy motif for a small kitchen. It will make the space look even more cramped. You can also paint the walls in a contrasting shade. For example, if you have chosen creamy white for the other walls of your kitchen then you may opt for tangerine or charcoal grey for the feature wall. Yes, it is possible to place artworks in the kitchen and give it a stunning makeover. You invest in framed fine art paintings. From abstract motifs to still life paintings, there are plenty of options available in front of you. 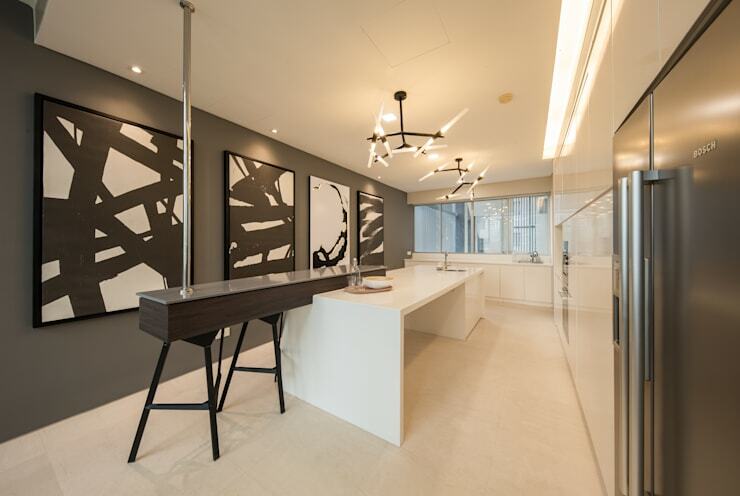 Abstract artworks look best in a modern kitchen. You may also buy framed fine art photographs to decorate the feature wall. Small sculptures strategically placed in the corners also help beautifying this space. Invest in stylish barstools or dining chairs is a smart way of redecorating the kitchen interior in a fuss free manner. Don’t throw away your old chairs. Recycle them for other parts of your home like the barbecue zone on the terrace or the hallways. You may even repaint the old chairs and bring them in tune to the chosen colour scheme of your kitchen. 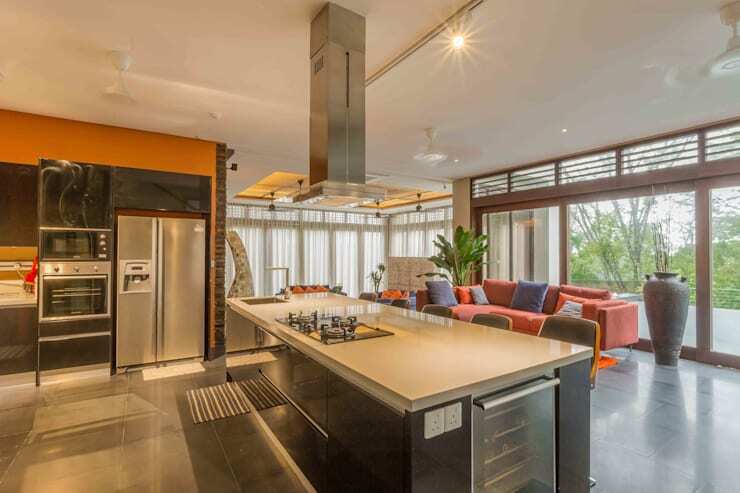 When in the need, don't hesitate to contact an experienced kitchen planner. 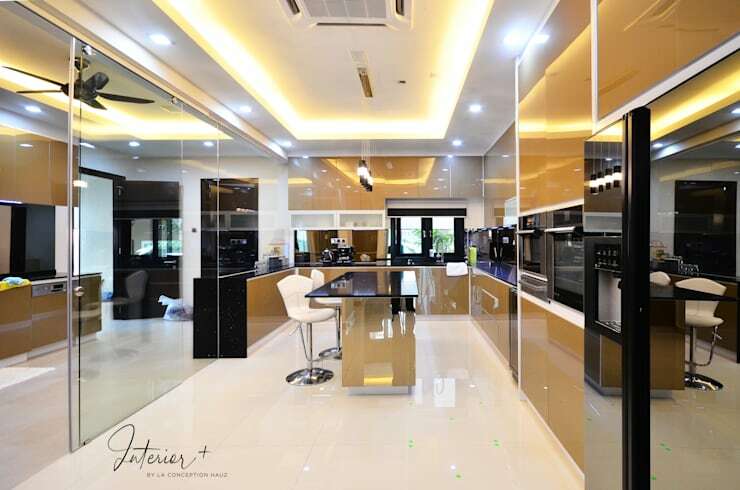 A clean kitchen certainly has a telling effect on the beauty of the ambience. Take some time out every day to remove the stains from the worktop and food wastes around the oven. This will help you have a more hygienic kitchen environment as well. Moreover, cleaning it every day will maintain its shiny look and prevent discolouration of your furniture and kitchen worktop. Built in cabinets are best for modern kitchens. They give a neat and organised feel in this space. You may also invest in floating shelving systems or wire racks to maximise the storage space and give the space a chic feel. The ingenuous design of the bottle rack like the one on the image above can easily become a focal point of your kitchen. Mirrors help in maximising the available light and make the room look more space. Your kitchen tends to look more cheerful in their presence. 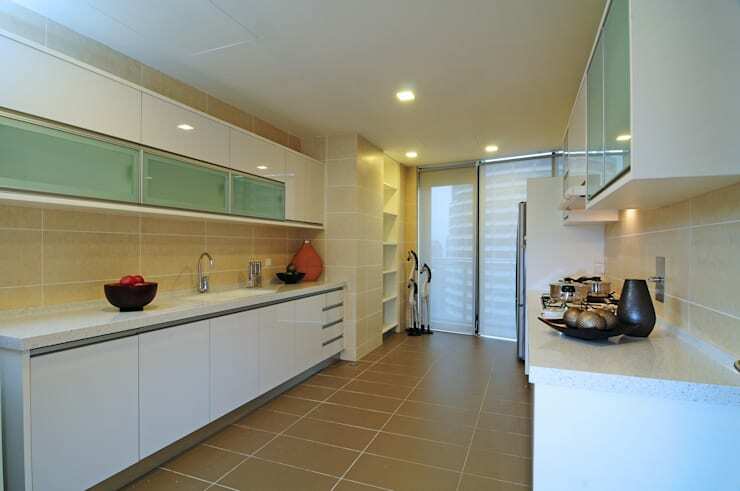 You may buy kitchen cabinets with mirrored doors or invest in framed mirrors for the feature wall. But don’t overdo this. Try to merge it into the overall scheme of the design. 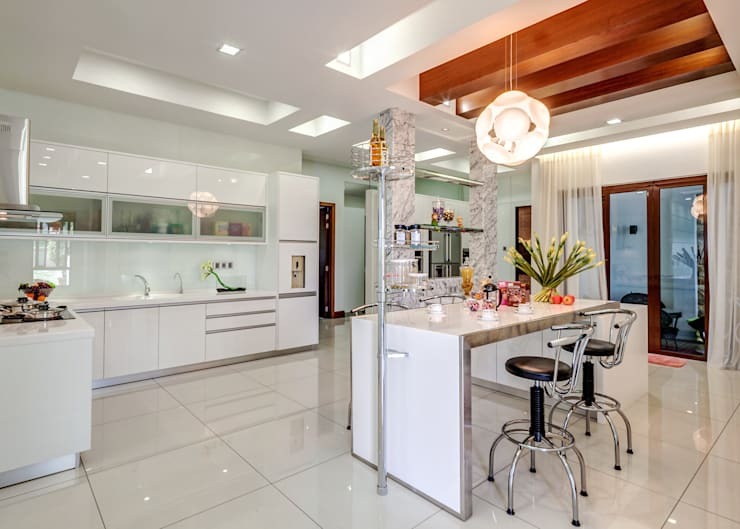 Check out these tips to make your small kitchen more comfortable for work. Take inspirations from some of the most inspiring minimalist kitchen designs. Which of these kitchen redecoration tricks do you find most interesting?